Payday lenders who gouge working-class Texans with annual interest rates that can exceed 1,000 percent dispersed $1.4 million to Texas politicians in the 2010 election cycle, a new Texans for Public Justice study finds. Industry-financed politicians will now decide if this industry should be regulated at all. 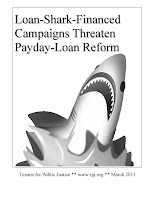 As a House Committee prepares to hold payday hearings tomorrow, see which campaigns enjoyed the biggest predatory paydays in TPJ's Loan-Shark report.